Looking for the perfect new addition to your gameday wardrobe? 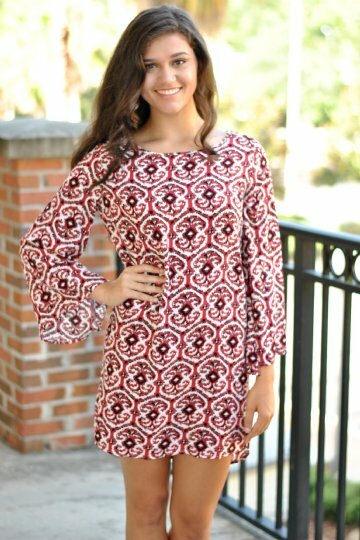 This lightweight shift dress features long bell sleeves and an elegant cutout at the back neckline. Brianna is 5'7 and wearing a small. Size: Small, 2/4 Height: 5'7"
Must have fashion piece: Necklaces, earrings, rings . . . I love it all! Interesting Fact: "I've been dancing for over 13 years."